An American and two Russians are headed back to Earth aboard a Soyuz space capsule after a smooth undocking from the International Space Station Tuesday (Sept. 10). 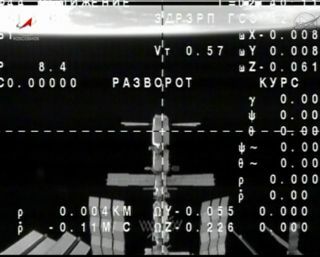 The Russian-built Soyuz spacecraft undocked from the space station at 7:35 p.m. EDT (2335 GMT) to begin the journey home for NASA astronaut Chris Cassidy and cosmonauts Pavel Vinogradov and Alexander Misurkin. The three men launched into orbit in March and spent 166 days living on the space station. The Soyuz TMA-08M spacecraft and space station were sailing 250 miles (402 kilometers) over Mongolia when they parted ways. Recovery teams from Russia's Federal Space Agency are awaiting the capsule's re-entry and landing. Earlier Tuesday, the three returning space travelers bid farewell to their crewmates remaining behind on the space station with hearty hugs. Vinogradov commanded the space station's Expedition 36 crew. His return home marked the station's switch over to the Expedition 37 mission, led by cosmonaut Fyodor Yurchikhin. NASA astronaut Karen Nyberg and Italian astronaut Luca Parmitano round out the Expedition 37 crew. "Are you sad to leave the space station?" Russia's Mission Control asked the Soyuz crew. "We actually left some food there so we could come back," the cosmonauts and astronaut replied. The Expedition 36 crew of the International Space Station waves farewell before undocking a Soyuz space capsule to return to Earth on Sept. 10, 2013. They are Russian cosmonauts Alexander Misurkin (right), Pavel Vinogradov (left) and NASA astronaut Chris Cassidy. During his time in space, Cassidy ventured outside of the space station on several spacewalks, including an unplanned spacewalk 35 to repair a leak of ammonia on the outside of the station. For his last bit of time on the station, Cassidy collected urine and blood samples, storing them inside the Human Research Facility's science freezer, according to NASA officials. He also replaced a fluids control and pump assembly in the Tranquility node's water recycling system. Yurchikin, Nyberg and Parmitano arrived at the space station in May. They will be joined three new crewmates — Russian cosmonauts Oleg Kotov and Sergey Ryazanskiy and NASA astronaut Michael Hopkins — once that new crew launches on Sept. 25. The $100 billion International Space Station has been continuously manned by astronauts and cosmonauts since 2000. Construction of the orbiting laboratory began in 1998, with five different space agencies and 15 countries overseeing its assembly. It is the largest manmade structure in space.